Today is my birthday and the first official post of the 2015 March birthday series! While I don’t go all crazy about my own birthdays, I do LOVE birthdays! It is such a fun occasion to get together with friends and family and a nice excuse to treat yourself a little bit! For our household, March is the big birthday month! Bryan and I were only born 5 days apart, so both of our birthdays fall in the first week of March. So does my best friend’s (Happy Early Birthday, Erin!). Then there are at least 5 other March birthdays that I can think of off the top of my head, including my mother-in-law. SO LOTS OF CELEBRATING! 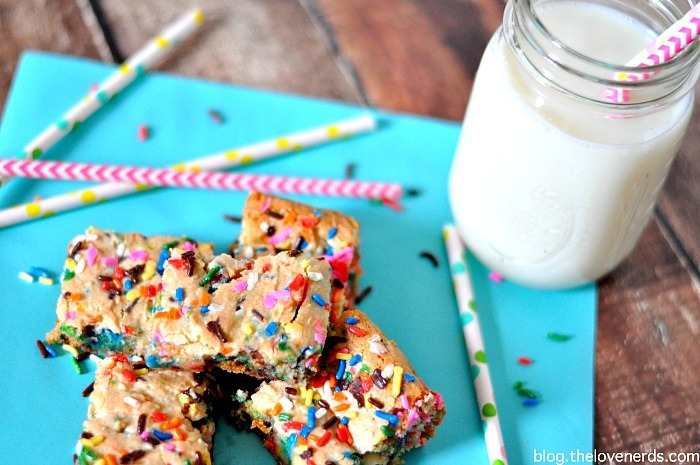 These Funfetti Blondies are going to become a part of the annual birthday celebrations. They are definitely a bit fudgy in the middle and they did not cut as cleanly as my Type-A personality likes. AND they are delicious! Bryan took some of them to his RA staff meeting, and I totally expected a couple to make it home. NOPE! They plate was crumb free. 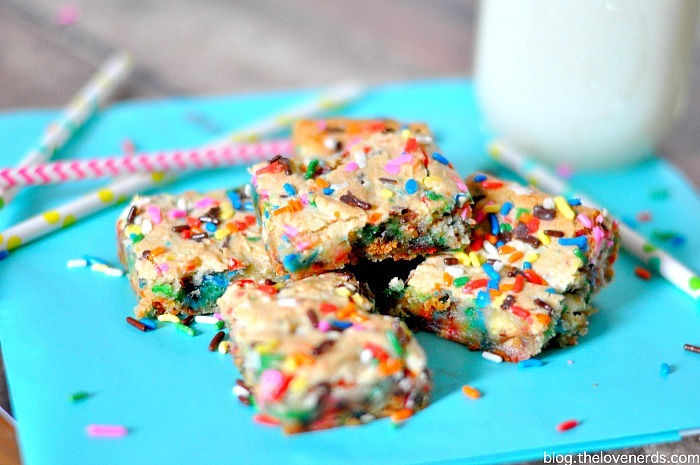 Funfetti Blondies - The perfect birthday treat! Preheat oven to 350F degrees. Spray 11x7 baking pan with nonstick spray. Combine well the first four ingredients in a large bowl. Then, add the milk slowly. You want the batter to be as thick as possible; not runny. 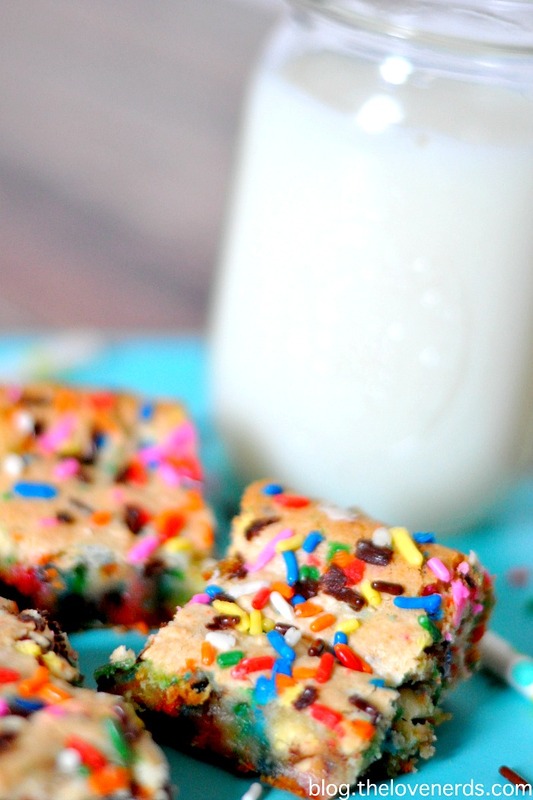 Mix in the sprinkles and the white chocolate chips. Pour the batter into the prepared baking pan. I like to add a few more sprinkles on the top. Bake for 30 minutes until edges are beginning to brown. The top of the blondies will usually begin to crack slightly as well. Allow to cool for at least an hour so the middle of the blondies can set. I normally like having them set closer to 2 hours. My birthday always falls near Memorial Day weekend, so I love to go on a weekend trip somewhere warm and sunny and hang out by the pool! Awh these are so special I love them! My birthday is on March 16, so I usually do a fun and fabulous birthday party with the fam that day. Then, the next day is St Patty’s Day, so I have a crazy Patty-Birthday-Bash with all my friends! My birthday wish this year is to win this contest, HAHAHA!!! I have been drooling over the Erin Condren Planners for so long now! Thanks for this AWESOME contest!!! I love to celebrate with my boys! I love picnics and just being with my husband and kids. That’s the best birthday! I try to celebrate my birthday all month long! I start off by having friends over for drinks and food one night. I bring treats to my coworkers one week. I have a small party with my family. And lastly I have a birthday dinner out with friends at my favorite restaurant. 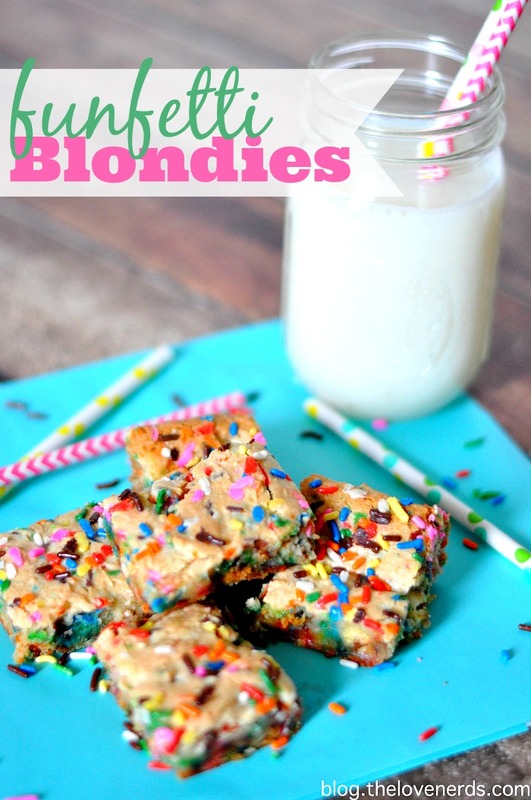 Think I’ll make these Blondies this year! I’d also like to celebrate with an Erin Condren ;)! We like to keep it simple. Dinner and cake with the family! I like to celebrate my birthday with family and close friends. We usually all get together and go eat and just enjoy the time together ringing in another year of life. I like to celebrate with a family dinner followed by delicious homemade red velvet cake. Lunch with friends; dinner with hubby. I usually like to celebrate my birthday with food. We usually go out to lunch or dinner with family and friends. I usually don’t celebrate my birthday, but when I do I like to just treat myself to something nice like a movie, dinner, or a nice dessert. Happy Birthday! 🙂 We like to celebrate birthdays just with a small family gathering and maybe a noisy board game or two! I love birthdays and pretty much any other reason to celebrate, but my birthday is always a back burner thing. Lol I’m lucky to get a card and a cake. This year, my husband did get me a cake, but no card or gift, so my MIL was the only person that gave me a gift and got me a sparkly card. That lady speaks my love language! My husband and i are just a few days apart, also! We usually do a family thing with him and our kiddo and cake for me and dinner out for my birthday and every year or every other year i *Surprise* him with a giant party of all our friends with different themes like Cinci de Mayo (he was born may 5th) or star wars complete with costumes and fun themed foods and decor. And cake. Always cake. Haha. I like to do it all. It usually takes at least a week! Family, friends, dinners, movies -fun! With LOTS of love!!! My kids shower me with handmade cards- my mom and step dad take me to lunch one day during the week- my husband and I go on a NICE date.. and the whole family gets together to do cake and sing! LOVE it. I’ve really never celebrated my birthday. Going out for Sushi is the best! I like to celebrate by sharing some good food and good laughs with my family. My mother always made me this delicious tortilla soup…I’ve never seen another recipe like hers, and I’ve never loved another tortilla soup as much. Now that I’m grown and moved out, my husband makes the soup for me. When I was a kid, my mother made chocolate cake w/German chocolate frosting. Now that I’m grown, I figured out I like pie better than cake lol. With cake and my family! I love doing something, anything, fun with people that I love! This year i will bring in my Dirty 30 doing a fun mud run with my friends and family! My birthday is Halloween so we give out candy and get to watch the kids in costumes! I like to celebrate my birthday by just hanging out with my family. Dinner and a movie or dinner and game night usually make me really happy on my birthday because it brings us together and we have fun with one another for one evening without worrying about anything. My family calls me and they all sing happy birthday. Usually my dad does an Elvis impersonation. I usually celebrate my birthday pretty low key. Dinner, cake, and family! I like to spend time with family, friends, and my fiance! Nothing fancy! I like to have lunch with the family and some me time, thanks! My birthday was last week, and we celebrated by going out for dinner so I wouldn’t have to do anything for my day! Nothing too exciting…just dinner with the hubs! My birthdays this weekend too! Im celebrating my going out to dinner with my family and friends. Great give-away! Love these Life Planners! In my mind, the best birthday celebrations are small dinners with friends!